Jerry: What did he do? Jerry: Like they wouldn’t have discovered that anyway! Well, I’ve always liked Vasco da Gama. Columbus may have discovered America, but he was supposed to be going to India. Da Gama actually set out to find a passage to India, and he found it! I have always really liked his name, too. It has a nice ring to it. I’m sure if he were alive today, he’d probably be designing shoes for Barney’s. 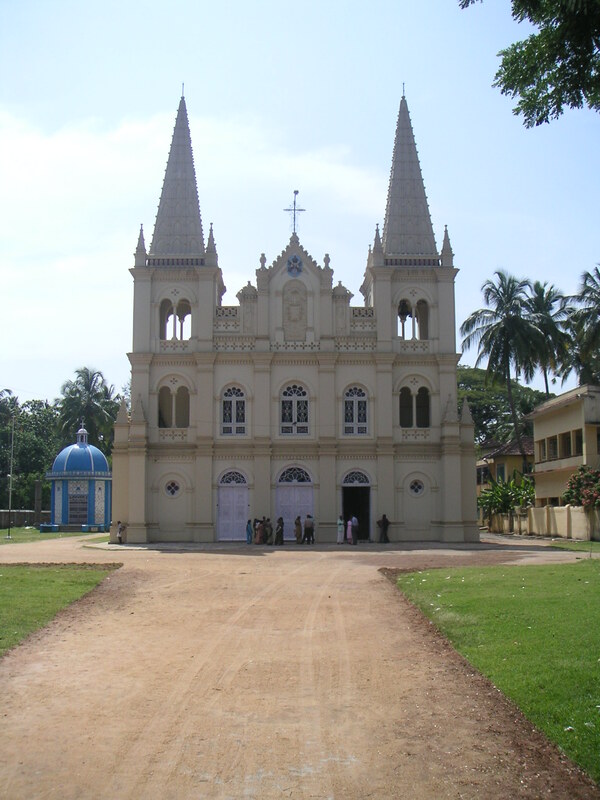 Nevertheless, when we booked our Kerala trip, one of the sights I knew I had to see was Vasco’s former grave in Cochin. He was buried in the city’s St. Francis church for 14 years before his remains were disinterred and moved to Lisbon. On another note, I was also intent on seeing Cochin’s Synagogue, the oldest one in India (and, quite possibly, in Asia). Anthony and I had been lucky enough to stumble upon a photography exhibit on the history, culture, and dwindling population of the Jews of Cochin in Washington last spring. There are quite a few links about the community online, but I wish I could remember the name of the photographer whose pictures and videos set our trip itinerary in motion. We arrived in Cochin some time after noon on Sunday. Mass was letting out, Diwali festivities were wrapping up, and people were going about their Sunday visits. Cochin seemed more like the India I knew from Mumbai: a little trashed, a little noisy, and a little busy. But it still had the kind of lazy attitude of a Caribbean township. Our hotel was located in Fort Cochin, the area where most of Cochin’s heritage buildings and attractions were located. In fact our hotel, the Malabar House, was itself a renovated colonial villa, complete with amenities and European clientele to match. Don’t get me wrong, it was a beautiful hotel. But it was Cochin Lite. Still, its positioning couldn’t be beat – across the parade grounds from St. Francis. As, we were scheduled to go on a tour of Cochin later in the afternoon, we decided to take a stroll around the neighborhood. We started out walking the perimeter of the “parade grounds,” a glorified cricket field, whose resident goats and cows kept the pitch well manicured. In truth, the field was kind of a dump, but it was more green space than Mumbaikars had the privilege of having. I also can’t erase the picture in my mind from later on in the day when a tour bus pulled up next to the grounds, pulled out his trash can, and proceeded to dump the contents onto the grass. Where in the hell does that mentality come from? We (the world) need to start an anti-litter campaign akin to the one that was seemingly so successful in the U.S. in the 1970s. Anyone with me? We trudged on. The first real stop on our mini-tour was the Santa Cruz Basilica, a pretty, if garish church with a bit of an Indian-Hindu sensibility. All of the saints were clothed in shades of bright pink and blue and the pulpit glowed under chasing lights. Near the church grounds was a seminary, on whose walls were painted inspirational quotes from Gandhi as well as a local Catholic patron. Ah…the first sign in Cochin that religions can co-exist. Not much further was the Idiom bookstore. To our delight, Cochin has quite a number of bookstores. Anthony reminded me, of course, that Kerala has the highest literacy rate of any state in India. We browsed, along with the other bronzed, backpacking minions, and left a few thousand rupees later. To complete the circle, we passed in front of St. Francis. Inexplicably, the church was closed on a Sunday afternoon, so Vasco would have to wait until tomorrow. But we still had plenty of things yet to see, including “Jew Town” and its synagogue, the spice market area, the Chinese fishing nets, and the Mattancherry Palace, former home of the Rajahs of Cochin. If you extend your journey little further south to Kanyakumari, the southern most tip of Indian mainland couple interesting places not to be missed are “Vivekanand Rock memorial” and an excursion to the sea to see the mingling of gray arabian sea blue Indian ocean and green bay of bengal. Same Swami Vivekanand addressed the world religious congress in Chicago in 1893. May be you could also see the temple of Godess Kanyakumari; Lord Shivas wife Godess Parvati daughter of Himalaya. Since you are on the topic of Jews, coastal Maharashtra has been home to lot of Jews. Apparently they are called lost tribes of Jews “Bene Israel”. They are quite iter-mingled with the local hindu maharashtrian culture and it will be difficult to distinguish them. Mumbai’s public library is named after a benevolent Jew from 19 th century Mumbai – David Sasoon. Similar other example would be “Parsis of Western India”. Farsis or the ones who came from Persia or modern day IRAN to protect their cultural and religious beliefs from coming religious onslaught; the ones who migrated sometime in early last millennium to western India. I guess Indias host majority has been a generous and kind world citizen through the ages, true beacon of multi-culturalism centuries before the phrase became popular within last few decades.